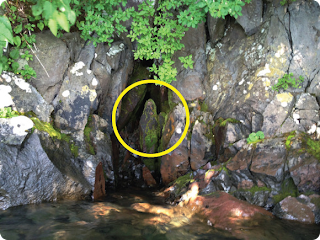 Many people in northern Aomori, Japan have discovered that Jesus really is a rock (not the Rock, unfortunately). It seems that a recently discovered rock formation in a hidden alcove along Lake Towada roughly resembles the silhouette of Jesus. Hundreds of tourists are boarding boats to take a closer look. A YouTube video describes the scene. The name of the lake begins with a Japanese letter that looks like a cross (十和田湖). That coincidental spelling bolsters the idea in the mind of some tourists that this rock is indeed religiously significant. Some have even suggested that this may have been a site of worship for Japan's hidden Christians during the brutal 16th century persecution. While I'm underwhelmed at the "discovery," what does impress me is that Japanese people would think to make a connection with Jesus. Remember that Japan has the least number of Christians (0.5% of population) of any developed nation in the world. So, I could understand if looking at this rock they were to see the shape of a goblin from Japanese folklore (it is approaching Halloween in Japan, too). I could also understand if they were to see a demon-like gargoyle, like the dozens you spot at any shrine or temple in Japan. But Jesus? 1) Regardless of the odd context, at least the conversation on Christ has begun. 2) Regardless of the poor response to Christianity, at least someone has left a witness that led to this connection with Christ. 3) Regardless of the wrong place they are looking, at least they are looking for Christ, and continuing to look. Naturally, I would hope that such oddball sightings would lead a Japanese to seek out solid truth presented to them by a Christian, in a church, or through a Bible. And perhaps they will. Who am I to say that God can't work that way? Perhaps these odd "discoveries" are small ways that God can find room to crack open the hardened Japanese heart just enough to, as the tourists looks at the rock, gently whisper, "You will look for me and find me when you look for me with all your heart" (Jeremiah 29:13). May God lead many Japanese to the Rock of our Salvation.